Above are Deming High School Shop and FFA Instructor, Larry VonTress, on Left, and FASF VP Roy Mantei in center, with FASF Trustee, Megan Wenzel at far right. They are examining the class built steel sign for the FFA Department, a marker that has successfully weathered many, many hot New Mexican summers and the blazing sun. FASF VP, Roy Mantei, and Trustee Megan Wenzel met with Deming High School (DHS) Teachers this past week to explore ways of further involving our local High School students as volunteers with the FASF, particularly in readiness for the upcoming FAS Centennial events of next year. Above are Shop Teacher, Larry VonTress and FASF Trustee, Megan Wenzel, discussing their common interest in the Future Farmers of America (“FFA”) organization and Megan’s own experiences with the activity during her own Elementary and High School years. Joining the conversation, on left, is FASF VP, Roy Mantei. 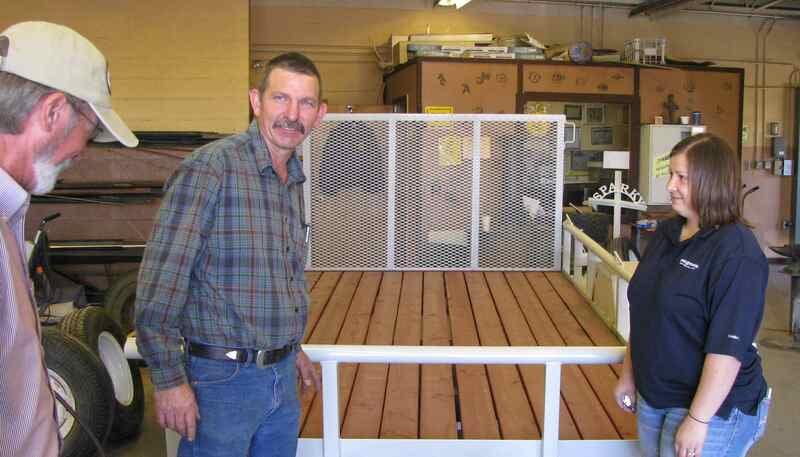 Mr. VonTress is showing Roy and Megan some of the fine professional caliber work done by his students, as evidenced by the high quality workmanship seen in the large white flatbed trailer just completed by his class. One of the stated missions of the FASF is to work with and help inspire young people to work productively in volunteer activities outside their normal school responsibilities. Such extracurricular activities have long proven to be fertile grounds for the development of excellent leadership and citizen participatory skills, which is why the FASF is putting so much effort into these projects that involve young students. Some of today’s FASF student volunteers could one day become the active leadership of the Foundation. 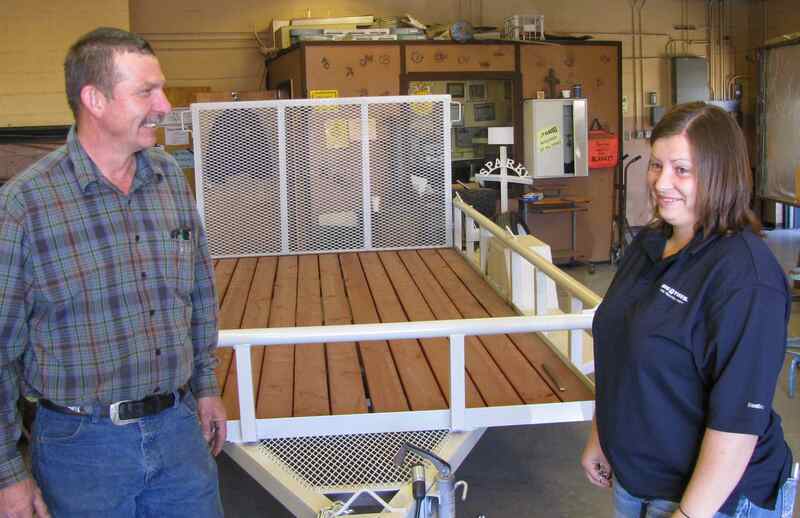 In the first three (3) photos from the top of this page, you can see Roy and Megan discussing the construction capabilities offered by DHS’s FFA and Shop students, under the direction of Larry VonTress, who teaches those skills to his students. They are standing by the Class’ outdoor welded sign. 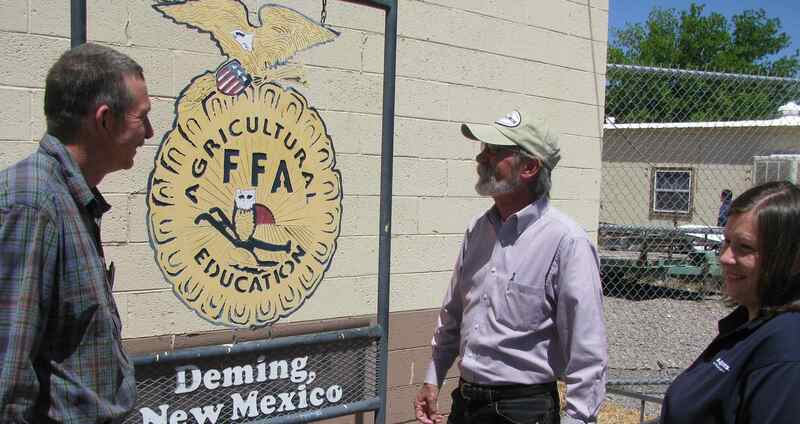 While at High School in Grants, NM, Megan was an active FFA participant and award winner, so she is more than familiar with Mr. VonTress‘ activities and his students’ potentials. This teacher’s students have already constructed some well-known and very professional looking memorials here in Luna County and Deming. Megan and Roy are exploring how Mr. VonTress‘ class might possibly help build the new Entrance Gateway to the Foundation’s FAS Airfield in Columbus. In the second two photos, above, Larry is showing Megan and Roy an example of the actual professional quality of which his students are capable. They are looking over a full-sized flatbed trailer recently built entirely by Mr. Von Tress’ students. The skills with which instructor’s students are trained range from automotive repair, to welding and construction. Other students at DHS, under the direction of George Wertz, are engaged in actual hands-on Construction Trades training, even building actual homes in Deming for the High School’s Teaching staff. These homes are of high quality construction and remarkably attractive, as well. Left to Right: U.S. Army Major Andres Leday, FASF Trustee Megan Wenzel, and, Right, FASF VP, Roy Mantei, in the Headquarters Building of the Junior ROTC (JROTC) on the Deming High School campus. Megan and Roy also spent considerable time discussing volunteer possibilities with the Junior ROTC Unit at DHS. They covered various possibilities with U.S. Army Major Andres Leday, who is the commandant of the 5th Brigade’s Wildcat Battalion Cadets. The principal thrust of the JROTC function at DHS is directed towards leadership training, of which volunteering is always a significant factor. Major Leday explaining how his Cadets undergo their leadership training along with some of the unique experiences membership in the JROTC otherwise provides his Cadets. On the right, along the wall, you can see the rifle rack. The JROTC unit at DHS has its own shooting team, and it has won numerous top honors, as can be seen by some of the trophies proudly on display above the gun rack, in the photo below. Megan is an avid rifle shooting enthusiast and hobbyist, so had many questions of Major Leday. Above and below, Major Leday, Megan and Roy discuss some of the opportunities for leadership training experience offered for Deming High School Students who volunteer for various FASF projects and activities. There are only eleven months remaining before the FASF will find itself deeply engaged in putting on the once-in-a-lifetime FAS Centennial Celebration in the Spring of 2016. Much needs to be done. The 75th anniversary of the raid itself drew some 25,000 visitors to Columbus! This entry was posted in HOT NEWS! on April 20, 2015 by FASFRIC.